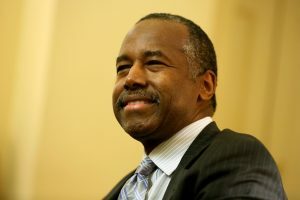 WASHINGTON — Housing Secretary Ben Carson sought Thursday to reassure his agency that budget cuts may not be as steep as some fear, even as housing advocates and others brace for deep reductions to public housing and anti-poverty programs. The cuts said to be under consideration, more than $6 billion, would target community development block grants and some public housing money. The idea would be to help offset some of the $54 billion increase in defense spending that President Donald Trump is seeking. “Rest assured, we are working hard to support those programs that help so many Americans, focus on our core mission, and ensure that every tax dollar is spent wisely and effectively,” wrote Carson, who was confirmed as HUD secretary late last week. The Washington Post reported late Wednesday that early numbers for fiscal year 2018 showed HUD’s overall budget being slashed about 14 percent, to $40.5 billion — including cuts of about $2 billion from public housing funds and the elimination of the Community Development Block Grant Program, which funds local improvement efforts and other programs. At his confirmation hearing in January, Carson took a softer approach toward the role of the federal government than he sometimes did on the presidential campaign trail, where he challenged Trump for the GOP nomination. When reminded that he had called for across-the-board agency spending cuts of 10 percent during the campaign, Carson told the Senate banking committee that he later modified that amount to 1 percent. New York City Council Member Ritchie Torres said public housing in his city is so financially and physically fragile that it cannot safely absorb the shock of a 14 percent reduction in HUD’s budget. In Newton, Massachusetts, Mayor Setti Warren said killing the community development block grants would be devastating to his community. “This critical program provides people with higher paying jobs, affordable housing and opportunities for children to reach their full potential,” said Warren. The block grant money has been used in Newton for infrastructure improvements to housing for seniors, open space projects in poorer neighborhoods and money for social service programs for children such as Boys & Girls Clubs. National Urban League President Marc Morial said cuts like those that are being discussed would undercut the agency’s mission. “It’s a cruel and unusual hit to say that we’re going to cut the most vulnerable citizens in America and we’re going to go spend the money on the implements of war,” Morial said. Left: Ben Carson, secretary of housing and urban development, is seen at a December meeting with U.S. Senate Majority Leader Mitch McConnell in his office at the Capitol in Washington, D.C. Photo by REUTERS/Jonathan Ernst.